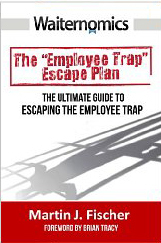 Congratulations to my client Martin J. Fischer, who has just published his transformative self-help book, “Waiternomics: The Ultimate Guide to Escaping the Employee Trap.” A former Las Vegas waiter (he tells me that his Vegas stories could fill a separate book! ), Martin made plenty of cash, but he knew that he was at the mercy of his corporate bosses. He escaped the paycheck prison and built equity in himself and his talents, and in this fast-paced book (which I had the honor to edit) Martin reveals his secrets for investing in yourself. Written with Brian Tracy and with a foreword by Dan Kennedy, bestselling author of the “No B.S.” book series, this book can help you to change your life. – Thomas Hauck is a Boston based book editor and ghostwriter.